LOS ANGELES - The elaborate mission to recover a moon rock led NASA agents to one of the most down-to-earth places: a Denny's restaurant in Riverside County. But at the end of the sting operation, agents were left holding a speck of lunar dust smaller than a grain of rice and a 74-year-old suspect who was terrified by armed officials. Five months after NASA investigators and local agents swooped into the restaurant and hailed their operation as a cautionary tale for anyone trying to sell national treasure, no charges have been filed, NASA isn't talking and the case appears stalled. The target, Joann Davis, a grandmother who says she was trying to raise money for her sick son, asserts the lunar material was rightfully hers, having been given to her space-engineer husband by Neil Armstrong in the 1970s. "It's a very upsetting thing," Davis told The Associated Press. "It's very detrimental, very humiliating, all of it a lie." 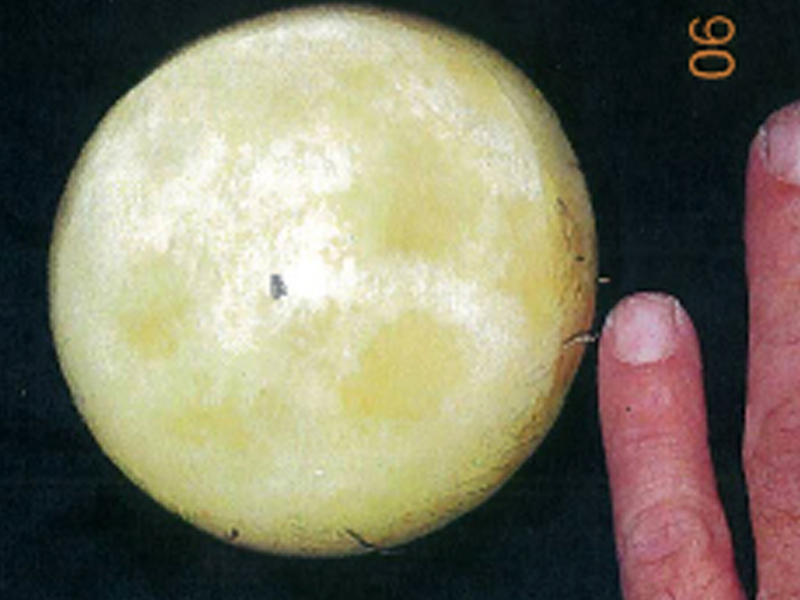 The strange case centers on a speck of authenticated moon rock encased in an acrylic-looking dome that appears to be a paperweight. For years, NASA has gone after anyone selling lunar material gathered on the Apollo missions because it is considered government property, so cannot be sold for profit. Still, NASA has given hundreds of lunar samples to nations, states and high-profile individuals but only on the understanding they remain government property. NASA's inspector general works to arrest anyone trying to sell them. The case was triggered by Davis herself, according to a search warrant affidavit written by Norman Conley, an agent for the inspector general. She emailed a NASA contractor May 10 trying to find a buyer for the rock, as well as a nickel-sized piece of the heat shield that protected the Apollo 11 space capsule as it returned to earth from the first successful manned mission to the moon in 1969. "I've been searching the internet for months attempting to find a buyer," Davis wrote. "If you have any thoughts as to how I can proceed with the sale of these two items, please call." Davis told AP the items were among many of the space-related heirlooms her husband left her when he died in 1986. She said she had worked as a lexicographer and he had worked as an engineer for North American Rockwell, which contracted for NASA during the Apollo era. Davis claims Armstrong gave the items to her husband, though the affidavit says the first man on the moon has previously told investigators he never gave or sold lunar material to anyone. In follow-up phone conversations with a NASA agent, Davis acknowledged the rock was not sellable on the open market and fretted about an agent knocking on her door and taking the material, which she was willing to sell for "big money underground." "She must know that this is a questionable transaction because she used the term `black market,"' Agent Conley states in the search warrant. Curiously, though, Davis agreed to sell the sample to NASA for a stellar $1.7 million. She said she wanted to leave her three children an inheritance and take care of her sick son. NASA investigators then arranged the sting, where Conley met with Davis and her current husband at the Denny's at Lake Elsinore in Riverside County. Soon after settling into a booth, Davis said, she pulled out the moon sample and about half a dozen sheriff's deputies and NASA investigators rushed into the eatery. When officers in flack vests took a hold of her, the 4-foot-11 woman said she was so scared she lost control of her bladder and was taken outside to a parking lot, where she was questioned and detained for about two hours. "They grabbed me and pulled me out of the booth," Davis claimed. "I had very, very deep bruises on my left side." Conley declined to comment and NASA Office of the Inspector General spokeswoman Renee Juhans said she could not talk about an ongoing investigation. Davis was eventually allowed home, without the moon rock, and was never booked into a police station or charged. The affidavit states authorities believed Davis was in possession of stolen government property but so far they have not publicly revealed any proof. "This (is) abhorrent behavior by the federal government to steal something from a retiree that was given to her," said Davis's attorney, Peter Schlueter, who is planning legal action. Joseph Gutheinz, a University of Phoenix instructor and former NASA investigator who has spent years tracking down missing moon rocks, said prosecuting Davis could prove tricky. Gutheinz said he recently learned that NASA did not always take good care of lunar materials. In some instances, space suits were simply hosed off and any moon dust on them lost forever. While bigger rocks, such as those given to various countries and museums were carefully inventoried and tracked, it now appears there are unknown numbers of much smaller pieces circulating in the public. Some of these may have been turned into paperweights and informally given away by NASA engineers. "I have a real moral problem with what's happened here in California," Gutheinz said. "I've always taken the position that no one should own an Apollo-era moon rock. They belong to the people. But if we did such a poor job of safeguarding (lunar samples,) I cannot fault that person." About 2,200 samples of lunar rocks, core samples, pebbles, sand and dust - weighing about 840 pounds - were brought to Earth by NASA's Apollo lunar landing missions from 1969 to 1972. A recent count showed 10 states and more than 90 countries could not account for their shares of the gray rocks.